Heat oven to 350°F. Sprinkle pork roast with 1 teaspoon kosher salt. In roasting pan, heat 2 tablespoons of the oil over medium-high heat. Add pork; cook about 2 minutes, turning occasionally, until browned on all sides. Remove pork from pan. Add remaining tablespoon oil to pan. Cook dinner roll halves, onion and garlic in pan about 1 minute or until roll is toasted. Place roll mixture in blender; set aside. Return pork to roasting pan; add 1/2 cup of the broth. Bake uncovered 10 minutes. Cover with foil; bake 25 minutes longer. Meanwhile, in medium bowl, soak chiles in hot water about 15 minutes; drain. To roll mixture in blender, add chiles, dried plums, tomatoes, thyme, marjoram, 1/2 teaspoon salt, bouillon, vinegar and remaining 2 cups chicken broth. Cover; blend on high speed about 1 minute until smooth. Pour blended sauce mixture into 2-quart saucepan. Cook uncovered over medium heat about 10 minutes, stirring occasionally, until thoroughly heated. Pour sauce mixture over pork in roasting pan. Cover and bake 20 minutes longer or until meat thermometer inserted in center of pork reads 160°F. Let stand 5 to 10 minutes before slicing. 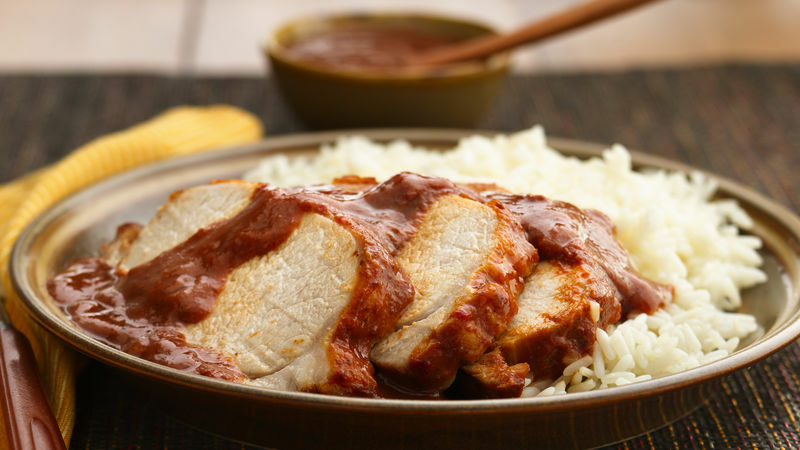 Serve pork with sauce.